NEW YORK (May 1, 2013) – The Chicago Blackhawks will play host to the Pittsburgh Penguins in a regular-season outdoor NHL® game at Soldier Field on Saturday, March 1, 2014, at 8 p.m. ET/7 p.m. CT, the National Hockey League announced today. The event is part of the 2014 Coors Light NHL Stadium Series™ – a group of NHL regular-season games planned for outdoor locations during the 2013-14 season. The NHL intends to announce more games as part of the 2014 Coors Light NHL Stadium Series™ in the coming weeks. "Our fans and our teams love outdoor games and we are thrilled the 2014 Coors Light NHL Stadium Series™ will present a number of these experiences to a large number of our fans in a variety of National Hockey League markets,” Commissioner Gary Bettman said. 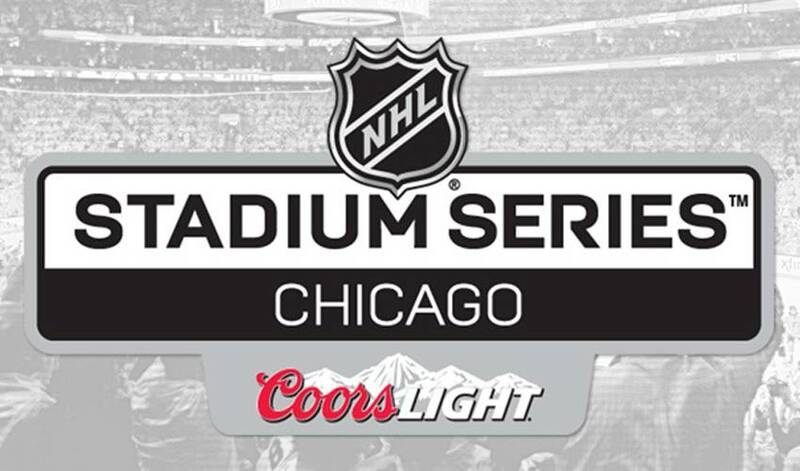 “The Chicago game, at Soldier Field, will be a match-up of two recent Stanley Cup® champions at a landmark stadium. We thank the Blackhawks and Penguins, Coors Light, Soldier Field and everyone involved in what will be a memorable, exciting and fun event." This marks the second time Chicago is hosting a regular-season outdoor NHL game. On a magical New Year’s Day in 2009, the Blackhawks played the Detroit Red Wings in the 2009 Bridgestone NHL Winter Classic®. The teams faced off in front of 40,818 fans who packed historic Wrigley Field and thousands more looking on from the rooftops across the street in comfortable 32-degree weather. No stranger to hockey played in the elements, the Penguins will be participating in their third regular-season outdoor NHL game since 2008. The first NHL Winter Classic® featured the Buffalo Sabres playing host to the Penguins at Ralph Wilson Stadium on New Year’s Day, 2008. The Penguins later welcomed the Washington Capitals to Heinz Field in the 2011 Bridgestone NHL Winter Classic®. The Blackhawks and Penguins enter the 2013 Stanley Cup® Playoffs as the top seeds in their respective conferences. Both teams have enjoyed franchise turnarounds in the last decade, largely due to successful drafts. Jonathan Toews (3rd overall, 2006) and Patrick Kane (1st overall, 2007) took the Blackhawks from a 29th-place finish in 2003-04 to the organization’s first Stanley Cup in 49 years in 2009-10. Sidney Crosby (1st overall, 2005), Evgeni Malkin (2nd overall, 2004) and Marc-Andre Fleury (1st overall, 2003) lifted the Penguins from last place in the League standings in 2003-04 to Stanley Cup champions in 2008-09. League partner MillerCoors has secured title sponsorship of the NHL Stadium Series™ for its flagship Coors Light brand. As the title partner for the event, Coors Light will be provided with a number of assets in addition to incorporating its logo into the official game and event mark. Highlights include on-air title broadcast rights, camera-visible dasherboard placements of the Coors Light logo, in-arena video spots and PA announcements, activation across key retail and on-premise accounts and integration of the Coors Light brand throughout all NHL media properties - including video, print, digital and radio. Further details on this special NHL event, including national broadcast information and specifics on ticket opportunities for the season-ticket holders of each team, will be released shortly. Fans interested in receiving more information on ticketing, news and special offers around the event should register at www.NHL.com/2014Chicago. NHL Network™ and NHL.com will provide extensive coverage live from Chicago leading up to and after the game. NHL Social will have exclusive coverage on all social platforms, including the use of the hashtag #StadiumSeries. Since the NHL established the tradition of hosting regular-season games outdoors to celebrate the origin and traditions of hockey, fans across North America have expressed their desire for those celebrations to spread further across the hockey landscape. Five of the six most-watched regular-season NHL games in the U.S. in the past 37 years have been played outdoors. The 2011 Bridgestone NHL Winter Classic® in Pittsburgh on NBC aired in primetime and was the most-watched NHL regular-season game ever in the U.S. with an average of 4.5 million viewers. The event also drew the largest audience on CBC for any of the U.S.-based outdoor NHL games. The NHL recently announced that the 2014 Bridgestone NHL Winter Classic® is scheduled for Wednesday, Jan. 1, when the Detroit Red Wings will play host to the Toronto Maple Leafs at Michigan Stadium on the University of Michigan campus. It is anticipated that the 2014 Bridgestone NHL Winter Classic® could set a world record for attendance at a hockey game. The first-ever NHL regular-season game contested outdoors was played in 2003 when the Edmonton Oilers hosted the Montreal Canadiens at Commonwealth Stadium. For the 2010 Bridgestone NHL Winter Classic®, the Boston Bruins hosted the Philadelphia Flyers at Fenway Park. In February 2011, the Calgary Flames hosted the Canadiens in the 2011 Tim Hortons NHL Heritage Classic ™ at McMahon Stadium. In 2012, the Flyers hosted the New York Rangers at Citizens Bank Park.